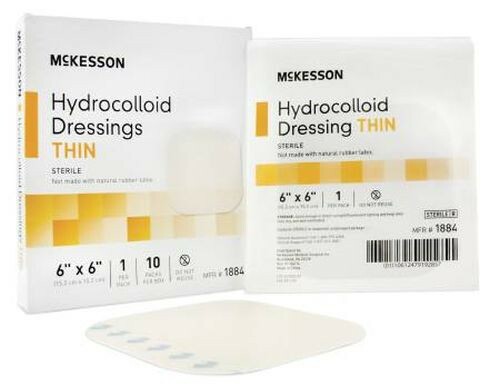 Hydrocolloid Dressing by McKesson are an excellent primary or secondary wound dressings with mild to moderate exudate. 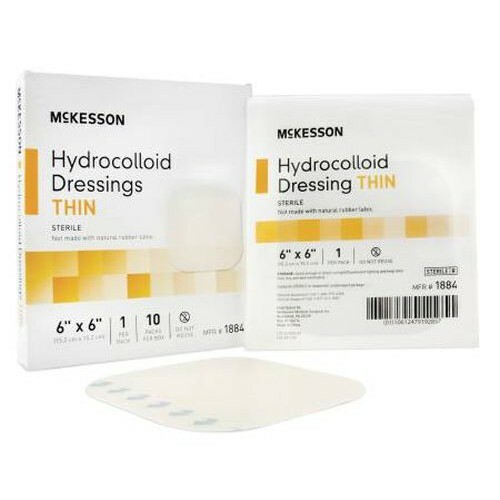 The Hydrocolloid Dressing is formulated to help maintain a moist wound environment for assisting in autolytic debridement. The dressing forms a fluid gel environment over the wound bed when it comes in contact with the wound exudate, which helps to facilitate healing. Hydrocolloid Dressing is strong enough to not break down and is formulated to not leave residue behind. Unlike most bandages, the smooth, tapered design of the edges helps prevent rolling up. The semi-transparency allows for visualization of the wound in order to monitor its progress, while the moisture-resistant backing helps to prevent urine, feces, or moisture from makings its way into the wound, reducing the risk of contamination. Vitality Medical also carries other items that would pair well with the Hydrocolloid Dressing, such as Smith & Nephew Skin Prep Protective Dressing Wipes and Simply Saline Wound Wash. Aims to Provide An Optical Wound Healing Environment With a Matrix Design That Delivers Enhanced Absorbency, Flexibility, and Overall Patient Care. Not Only Does the New Design Help Prevent Residues From Leaching Into the Wound Bed, But It Keeps the Wound Contact Layer Intact, Reduces the Potential For Skin Maceration, and Assists in One-Piece Removal. Cohesive Dressing Removal System Does Not Break Down or Leave Residue In the Wound and Facilitates Easy Removal Without Tearing the Dressing or Skin. Wound Contact Layer Remains Intact and Minimizes Potential Wound Bed Disturbance. Low-Profile Rounded Corners and Smooth Tapered Design Helps Reduce Edge Roll-Up and Risk of Shear Friction. Moisture Resistant Outer Barrier Film Helps Prevent Urine, Feces, and/or Moisture From Penetrating the Dressing Reducing the Risk of Contamination to the Wound. Up to 7 Day Wear Time Provides Undisturbed Moist Wound Environment, Enhances Healing, Minimizes Skin Maceration, and Reduces the Risk of Contamination to the Wound.